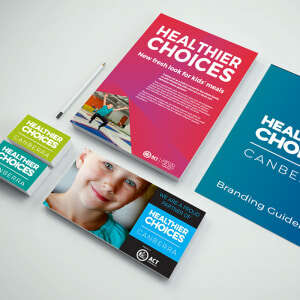 For the past year, we have been working with ACT Health to design a brand that could distract people in supermarkets, clubs, restaurants, cafes, hospitals outlets, cinemas, kids play centres and junior sports canteens. With some of those environments already heavily saturated with marketing of less than healthy food and drink choices, it was a big ask. But we did it and we are happy to announce that the branding is already starting to appear in local and independent supermarkets here in the ACT. Partnering businesses had to meet certain criteria to participate and all those involved have been really enthusiastic because they can already see the demand from their customers for healthier options. The RUC in Turner, is a partner in the program and also assisted Threesides with access to the club for photo shoots so we could include local content in collateral. They were one of the first businesses to show interest in the program because they could see the need for healthier choices in the Canberra community. We can’t wait to see the next stages of the program where marketing materials will be rolled out to all the sectors over the coming year so Canberrans can easily identify healthier food and drink choices when they are on the go and eating away from home.